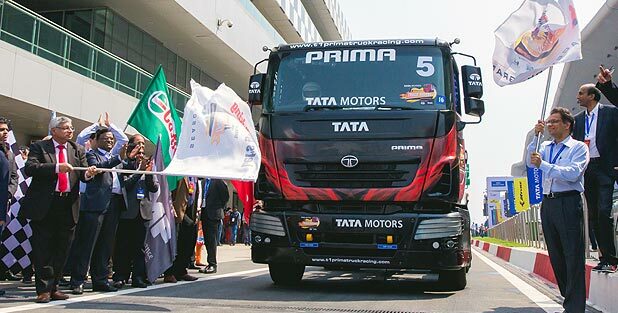 Tata Motors today announced the final 12 Indian truck racers, who will compete in the SUPER CLASS category of Season 3 of the T1 PRIMA TRUCK RACING CHAMPIONSHIP 2016, at the internationally acclaimed Buddh International Circuit (BIC), Greater Noida, on March 20, 2016. Selected under the first-ever T1 Racer Program (TRP), by Tata Motors the new Indian Truck Driver Race selection and training program, was based on the company’s strategic objective of making the profession of truck driving aspirational and at the same time act as a catalyst to induct drivers into the commercial vehicles profession. These Indian Truck Drivers have been selected from a pool of truck drivers who are employed with Tata Motors’ key customers, from all over the country. Alongside some edge of the seat action at T1 2016, Season 3 will also host some of the country’s most prominent names from the music and entertainment scene. From the sensational Hip Hop heartthrob Badshah to the vivacious damsel of melody, Neeti Mohan, the scintillating Garima Yajnik with her foot-tapping Indo-western numbers and last but not the least, the ruling diva of Bollywood music with her memorable feast of melody and dance numbers, Sunidhi Chauhan, are few amongst the many other surprises that T1 season 3 has to offer. The T1 PRIMA TRUCK RACING CHAMPIONSHIP is organized by MMSC (Madras Motor Sports Club) and is inscribed on the calendars of FIA (Federation Internationale de l’Automobile) and FMSCI (the Federation of Motor Sports Clubs of India) with safety and performance standards being followed as per the guidelines of the BTRA (British Truck Racing Association), who also play in role in the selection of the best British and European Race Truck Drivers, that compete in the T1 Championship. The FIA is the governing body for world motor sport and the federation of the world’s leading motoring organizations. One of the core responsibilities of the FIA is the development of motor sport worldwide. Through its national member clubs the FIA is involved in every level of motor sport and its remit extends to the millions of amateurs and professionals who enjoy motor sport in all of its variety. The FMSCI is a long-standing member of the FIA and is the only national motor sport federation recognized by the Government of India, for the promotion and control of motor sport in India, and is affiliated to the prestigious Indian Olympic Association. Being developed with Tata Motors subsidiary – Tata Daewoo Commercial Vehicles (TDCV), Tata Motors conceived the award winning Tata PRIMA range, setting new benchmarks in the performance and design of a next-generation commercial vehicle, based on superior technology, optimum power, fuel efficiency and safety. Built with technical inputs from across the world, the Tata PRIMA range is based on an Italian cab design, engine technology from the US and Europe, gearbox expertise from Germany, chassis frame know-how from Mexico, sheet metal dies from Japan and Korea, combining Swedish precision on a robotic weld line, hence is also referred to as the ‘World truck’ by Tata Motors. Equipped with strong aggregates and a robust chassis frame and suspension, the Tata PRIMA range meets the highest operating standards under extreme conditions, thanks to outstanding material and build quality, comfort, driving dynamics, offering customers with of lowest cost of operations. A multiple award-winning range of trucks from Tata Motors, the Tata PRIMA is today available in different trims, including multi-axle trucks, tractor-trailers and tippers, apt for several applications, thus meeting varied end-user requirements, with its power, sustainable speed, safety and reliability, best-in-class, aggregates, cabin features and comfort, was uncompromisingly designed for long-distance/ hours of transportation.